Hello, my name is Diana Day. I have been quilting off and on since about age 12. Now if you think I am going to add the number of years that is, think again. 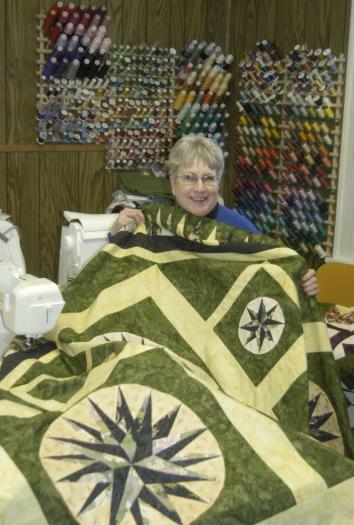 My mother was a quilter, and has just recently given it up at age 95. 11 years ago, my wonderful husband bought me a serger sewing machine. 8 sewing machines later, he said he "had to buy me a toy box to put them in" - our store building. Diana's Quilts -n- Things had outgrown our home and needed more room. My husband was thrilled when we moved my business to this elegant store and we got our house back! We've put the store space to good use a little more efficiently each year since 2005. Today, Diana's is a combination quilt shop and gift store. We have hand crafted items, made by 45+ Montana artists. The Mariners Compass quilt (#6-1186) pictured is for sale. It is queen size. If you need help ordering or have a question about a quilt for sale, I'm the best one to talk to. Please contact me before shipping. 1. Q: How do I order an item? A: Please telephone Diana's Quilts-n-Things at 406-632-4861 during my business hours to place your order. 2. Q: Do you charge sales tax on out-of-state orders? A: Montana has no sales tax. I never have to charge my customers tax. 3. Q: Can you gift wrap? Enclose a note? Accomodate special shipping needs? A: When you call, please ask for what you want. Personal service is a priority here. 4. Q: Do you offer classes? A: Yes, I do. You can read about them on my Events page. 5. Q: Do you have a Facebook page? A: Yes, I do. You can find it at the Diana's QuiltsThings page.